Lúcia: We must say the rosary first. Francesco: All right. You start, Lúcia. Francesco: No, no. Let's do it the short way. The apparition of the Virgin Mary at Fatima to three peasant children in 1917 is one of the most cherished miracles of the 20th century. In the field where Mary is said to have revealed three prophetic statements there now stands a glorious Basilica and millions travel to the Portuguese city each year. The devotion is immense and the story surrounding the events during those six months in 1917 is astonishingly compelling. Count me among the Catholic faithful who don't believe in this particular apparition, but I'm in the minority and, quite frankly, I hope I'm wrong. Regardless of one's own personal belief in miracles, The Miracle of Our Lady of Fatima is a touching movie that offers its source material to the good ol' fashioned Hollywood treatment. While Portugal is under the rule of a socialist police state, the Catholic clergy must be careful to avoid being arrested and having their church's shut down. Out in Fatima, Father Ferreira (Richard Hale) and his parishioners enjoy a peaceful existence far removed from the ravages of World War I and the tyrannical rule of the government. All this begins to change, however, when young L�cia (Susan Whitney) and her cousins, Jacinta (Sherry Jackson) and Francisco (Sammy Ogg), are playing in her father's field. As they begin to pray the rosary, a cloud forms and the Blessed Virgin appears to them on top of a tree. She promises to return on the 13th of each month for the next six months and the children are filled with a sense of awe and wonder. All this fades, though, when L�cia's mother, Maria Rosa (Angela Clarke), doubts her daughter and forbids her to return to the field. Word spread, nonetheless, and Portuguese citizens trek to Fatima for a glimpse at the Holy Mother. Ridiculed by the townspeople as a liar, L�cia yearns to see the apparition again but is practically held prisoner by her mother. Worse yet, the government's administrator (Carl Milletaire) tries to persuade the children to confess that Father Ferreira put them up to this hoax. With the help of local drunkard Hugo (Gilbert Roland), all three remain strong in faith despite the threat of death and the mysterious lady continues to come during the rest of the year, delivering messages of coming atrocities and promising a miracle that will make all who gather believe. Filmed in WarnerColor, John Brahm's film is a stirring telling. Told through L�cia's eyes, the movie doesn't pause to question the history of the event or look at a skeptic's point of view. I'm reminded of Danny Boyle's Millions while watching this movie, because both capture childhood innocence and faith wonderfully. Everything moves like a well-oiled machine here, from the Godless socialists who come to believe in a higher power to a magnificent rendition of the events that supposedly took place in the fall of 1917. Max Steiner's effective score is so good that just about every audience member will be tempted to make the journey to Fatima next year. The acting is fitting, even though it's tough to think of Susan Whitney as a Portuguese peasant, and helps bring an earnest quality to the film. As a movie, The Miracle of Our Lady of Fatima is a lovely slice of Hollywood that mixes the simplicity of L�cia's home life with the mystic circumstances of the miracle. It doesn't quite make me a believer, but it makes my yearning all the more fervent. Image Transfer Review: For some inexplicable reason, Warner treats the visual feast of this movie to a single-layer transfer. The image is exceptionally grainy and dirty, with lots of print defects and mosquito noise to boot. Colors are inconsistent, sometimes vivid, other times faded. How much of this is attributable to the source material is unknown to me, but this is not Warner's finest hour. Audio Transfer Review: The mono mix preserves the original theatrical experience nicely, coming across with minimal interference and delivering a crisp sound. Dialogue is always audible and Max Steiner's score sounds great. A French mono track is also available. Extras Review: The only supplemental material on this disc is the film's original theatrical trailer. Judging from the picture quality on this trailer, it doesn't look like the DVD mastering has improved the image quality one bit. 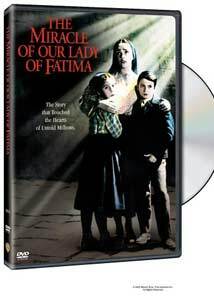 A fine movie for the family, The Miracle of Our Lady of Fatima rounds out Warner's Films of Faith Collection in good faith. The image transfer is a bit dirty, but otherwise this is a nice compliment to your collection.